Now don’t compromise with quality factors even if question is about your crucial data. At eSoftTools we have great deal for you at clearly low price, if you are looking for Lotus Notes to MSG converter software. The application is designed especially for users who required exporting unlimited data from NSF to MSG format safely. NSF to MSG Tool is a best and multi- faceted program built with advanced features along with included best option i.e Add file and Add folder. The Add file option helps users to load the needed files for migration whereas Add Folder option will load all NSF folders and export multiple NSF files to MSG file in single time with no data lose. 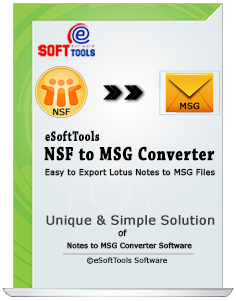 Lotus Notes Export to MSG Converter Software successfully Convert NSF to MSG files keeping the entire metadata properties of every lotus notes NSF mail file. 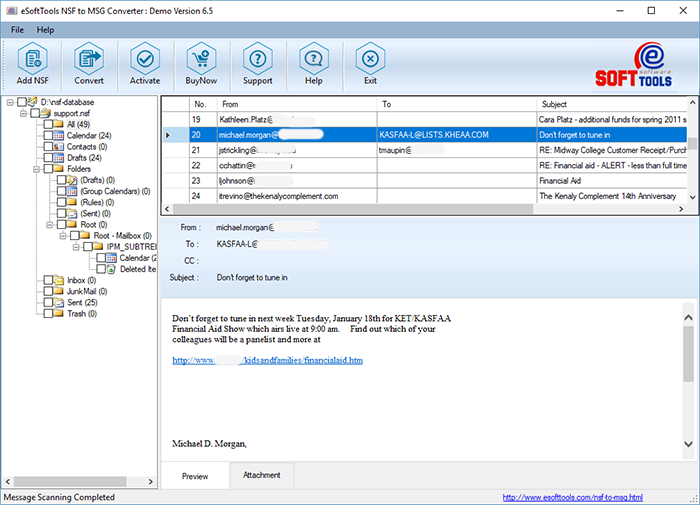 NSF to MSG Converter Software effortlessly extract meta information such as- emails, cc, to, bcc, sent/ receive, messages body content, formatting etc. NSF to MSG Tool is required the installation and configuration of lotus notes application to convert NSF to MSG File. NSF to MSG Tool supports all the editions of lotus notes email client such as- 9.1, 9.0, 8.0, 8.5, 7, 6 and below version. Any NSF File is completely supported by the software to successfully carry out the required process. NSF to MSG Converter Software allows users to convert the entire items present within NSF file such as- contacts, calendars, task, emails, journals and appointments. Now if you want, you have opportunity to convert selective items instead of converting them all. Simply check and un-check folders and items for conversion data into MSG file. Lotus Notes Export to MSG Software is powerful Application that securely recovers and convert names.nsf file to MSG file along with emails, contacts, calendars, task, notes, inbox items, journals and appointments. NSF to MSG Converter software never harm internal data while conversion and also preserve NSF file database. Take free demo of NSF to MSG Converter Tool - Free Demo software solve all problems and works on any condition. 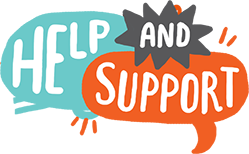 Demo allows save 30 emails per NSF file folder into MSG file format at free of cost. Can I convert NSF to MSG file without installing Lotus notes application? No, for conversion there you have to install IBM lotus notes application, after installing you can export lotus notes NSF to MSG file. I am using windows 10, so can I download the NSF to MSG Tool on this version of windows for conversion? 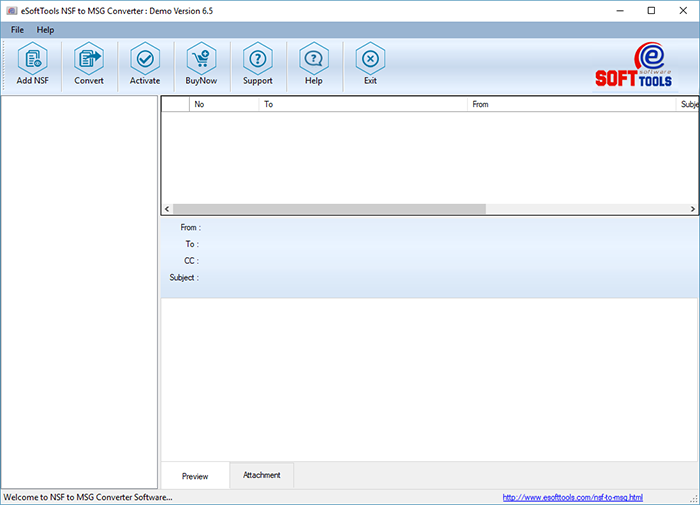 Yes you can download and lance the NSF to MSG Converter Software on any version of windows OS because the software is supported by all the earlier and latest version of windows OS. Can I convert other attachments files of NSF file to MSG format? Can I Convert Multiple NSF File with all attachments into MSG format using Software? Is there any size limitation of NSF file for Migration data into MSG file by software?